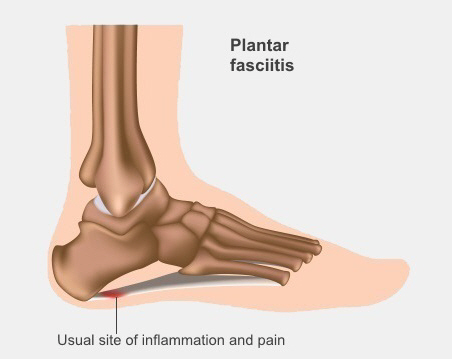 Plantar fasciitis (pronounced plarn-tar-fash-ee-eye-tis) is the most common cause of pain under one of your heels. The plantar fascia is a strong flat band of connective tissue (like a ligament). It acts like a bow string and supports the arch of your foot by connecting your heel bone to the ends of your metatarsal bones. have a tight Achilles tendon. When the arch of your foot is under increased stress it can cause tiny tears in your plantar fascia, usually where it connects to your heel bone. This causes inflammation and pain under or around your heel, when you're standing or walking. Sometimes it might even be painful when you're resting. pain that's worse when you're barefoot or walking up stairs. Your doctor, podiatrist, or physiotherapist will probably be able to diagnose plantar fasciitis after talking to you and examining your foot. They might order an X-ray or ultrasound scan if they're not certain of the diagnosis. What can I do to decrease the pain? massage your plantar fascia from the ball of your foot back to your heel – you can do this by rolling your foot over a golf ball, or something similar, on the floor. You may also want to take some anti-inflammatory pain relief, such as ibuprofen. Ibuprofen belongs to a group of medicines called non-steroidal anti-inflammatory drugs (NSAIDS), and you shouldn't take any of these for more than one to two weeks. Talk to your health professional if you still need pain relief after one to two weeks. NSAIDs can have some serious side-effects, especially if you take them for a long time. Two serious side effects are stomach pain and bleeding from a stomach ulcer. Some people with asthma, high blood pressure, kidney failure, and heart failure might not be able to take them even for a short time. If you're not sure if you can take NSAIDs, check with your doctor or pharmacist. If you've tried all these steps and your pain isn't getting better, you may need to see a podiatrist or physiotherapist to help your treatment. A podiatrist can look at what's causing your pain. They can make sure you are walking correctly and work out if you would benefit from strapping your feet, using special insoles (called orthotics), wearing different shoes, or doing some stretches. They can refer you to have further tests or assessments if necessary. If you need to find a podiatrist you can search on the Podiatry New Zealand website. In most cases you will have to pay privately to see a podiatrist, although ACC may cover treatment for some pain caused by an injury. A physiotherapist can help with massage and joint mobilisation. They can suggest ways to decrease the load you put on your foot, as well as give you exercises that will help to strengthen your foot, ease your pain and help to prevent future pain. If you need help finding a physiotherapist you can search on the Physiotherapy New Zealand website.